I'm a slave to fashion. Sorry for not updating loves. I'm having a CRAZY week with all the work and pullouts for shoots. I'm so exhausted!!! I haven't had a decent sleep for days. It's fun, yes, but imagine a tiny me carrying 5-7 bags full of shoes, accessories, clothes from Glorietta to Greenbelt then back to Glorietta then Megamall. Crazy. I think all the bags combined are actually heavier than me. I even grew a mouse sized muscle from all the carrying. For serious. Dinner at Orchard Road, Megamall. My first meal of the day!!! Murdered. Haha. Wednesday shoot for Depot Fashion mag. Meet Mane--the mannequin. Heee. After the shoot I immediately returned some of the items I pulled out and then pulled out some more. Hah. Saw this cute shoes from Schu! While waiting, I tried on some cute shoes! Of course. Still inlove with this pair. When will this go on sale? Hehe. @EGG, inlove with their vintage luggages and suitcases! P.S. Follow my bessy/co-stylist/katandem extraordinaire Jear's blog! Love love your denim jacket! Shape is so pretty, you could wear it up or down great piece! ... Wish I had a job like yours, dreamy! Such a hectic week, teh! But I can't help envy you with all those wonderful pull outs!! Schu and egg oh my! 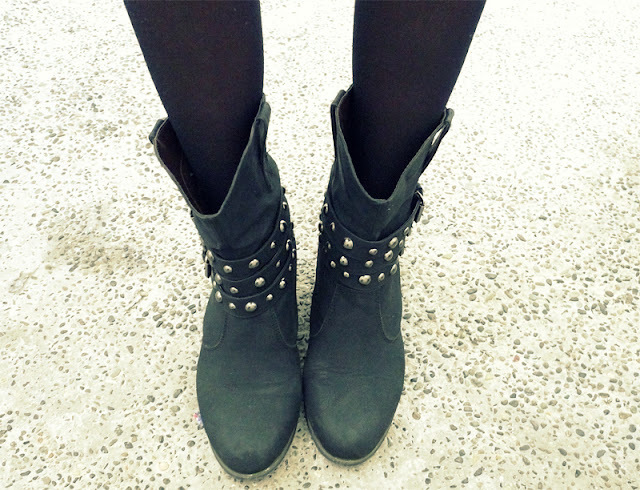 hehe :) Love the killer boots too! Good luck with your upcoming shoots! fight, fight, fight! Yes, I totally agree. Athena and Kathy are love. And so are the rest of the SM marketing girls. Plus, they're so kalog pa! What a great blog! So happy to have discovered it! Sniff! T_T So Sweet... I superlab our pic. Haha! Enjoyed assisting you in pullouts ^_* ... (@_@)Sometimes kalerki ka girl (suuuuuppperduper dami mong puullouts) but like you always said "Keri lang yan!" ^_^ See you soon! Love your blog, so you have a new follower. parang gusto ko na talagang magpa adopt sa inyo ni mich. weeeehhh! daming goodies!